A preschooler’s life is a time of amazing learning and development so theories and goals of education need to be set keeping in mind that every child is unique and talented in their own way. The formative years of education play a vital role in developing interest and inquisitiveness amongst children. The purpose and aim of the RANGOLI at this stage is to create a favorable and friendly atmosphere for the child to progress. This means providing the child the right opportunity so that he or she can relate to the surroundings. No formal textbooks are used by the students but through experimental and project based learning, the concepts are made known to them in a fun an interactive manner. Learning pedagogy has been designed to bring out the best in students. Encouraging: Teachers encourage children to express their thoughts which help them gauging learning outcome. Exploring: Children themselves start experiencing the things. Expressing: This is our methodology where teachers creatively EXPLAIN the concepts, ENCOURAGE children to EXPLORE things and to have experience of it and EXPRESS their thoughts; which help teacher judge the learning outcome. 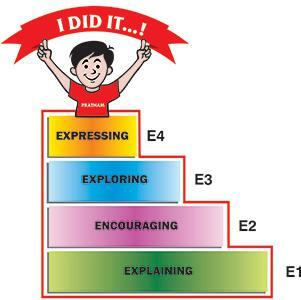 These 4E are the steps which help child to overcome and master every milestone of learning and development. Here teacher’s role is to explain and encourage the child and then child himself uses the environment created by teacher to explore experience and express the learning outcome. Primary school years are period of fast development and evolution. In this stage the students begin to recognize their real energy and it is required to be channelized and directed towards right path. It is a systematic process through which a student acquires knowledge, experience, skill and sound attitude. It makes an individual civilized, refined, cultured and educated. For a civilized and socialized society, education is the only means. Keeping all these things in the mind, we have developed the Four Petal Learning TM pedagogy which focuses on four pillars of holistic development i.e. Academics, Humanities, Physical Education & Sports and Reasoning development to achieve our goal i.e. holistic development. The outcome of the Four Petal Learning Tm pedagogy is “FUTURE READY CITIZEN”. At RIS – Gandhinagar, we are committed to provide best of academic environment to our students. Our classrooms are equipped with interactive boards. We also provide smart class teaching to our students but we always ensure that technology do not surpass the personalize teaching provided by teachers. We have laboratory for languages, computer, science and mathematics. Physical education and school sport can play an important role in the development of an active life-style, hence development and growth. We believe that physical education has to be built into the curriculum along with defined assessment methodology. Physical well being of a student is directly related to his or her performance. RIS has implemented the best-in-class Physical Education & Sports program in association with Edusports. The program is designed to offer the same firmness in sports and physical education as in academics. This ensures that children learn holistically through physical activity and sports that also help children improve their health and fitness levels dramatically. It brings out the competitive sides of student’s working (both body and mind) and also promotes sportsmanship. We have a defined assessment methodology for sports as well. We refer to the humanities as the study of arts – the visual arts such as architecture, painting and sculpture; music; dance; the theater or drama; and literature. They are the branches of learning concerned with the human thoughts, feelings and relations. Moreover, they are a means to enhance social interaction, leadership, healthy recreation, self-discipline and self-confidence. The teaching of the humanities is intended to make the students realize that the mere possession of knowledge is useless unless put to useful ends. Moreover, they would become aware that knowledge alone is meaningless unless it is accompanied by values, sentiments, priorities, insights, inter-relationships and other transcendent realities not subject to empirical proofs also form part of the person’s education. 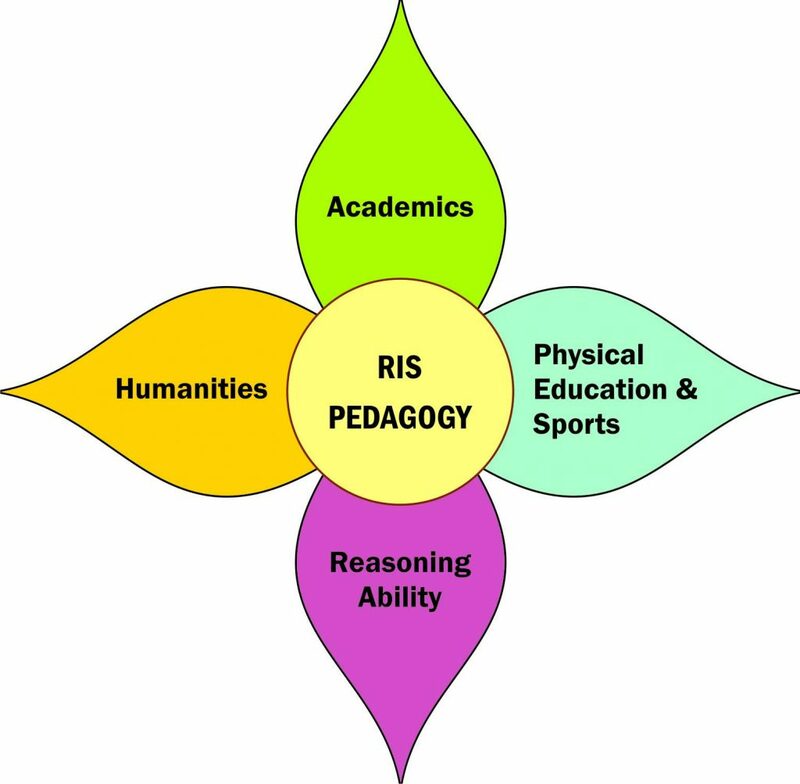 In the humanities, the students are exposed to these, thus, the development of the whole person, which is the goal of RIS. New generation students have to face the competitive world by the end and during their education cycle. In this cutting edge scenario, they must be strong in reasoning. Reasoning means the process of thinking about something in a logical way in order to form a conclusion or judgment. Mastering over it will not be overnight. We have introduced logic and reasoning as a subject from the primary level to prepare them right from initial stage. In the higher studies, it will help a lot to the students and the separate coaching will not be needed for it. Verbal Reasoning, Non verbal reasoning, Quantitative ability, Data interpretation. Students in this program are on entrance of serious learning. Rangoli has built this program on the structured, student centered and enquiry based foundation. Our students are prepared for broader horizon. The curriculum content is based on the recommendations of Central Board of Secondary Education (CBSE). Rangoli has balanced learning experience of its students between personalized touch provided by teachers and use of computer and other tools to reinforce learning. Rangoli places a strong prominence on the learning academic and practical skills. Rangoli stresses on understanding concepts rather than rote learning. Students are graded on 7/9 point grading scale system of Continuous and Comprehensive Evaluation (CCE).